For many years, high school students have loved patches featuring rock, punk, and heavy metal bands. Kids stitched them on to their backpacks like badges of coolness. You can still find similar patches at stores like Hot Topic, but you don't have to be a metalhead to enjoy a good patch. You can dress up a pair of jeans, cover a hole, or show off your achievements. The best part is, personalized patches are surprisingly easy to make if you can cross stitch. 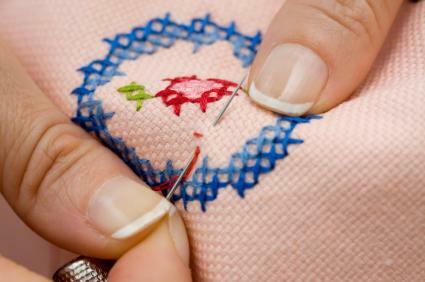 By its very nature, cross stitch isn't going to produce the tight, exact lines of an embroidered patch. But cross stitched patches have their own charm, and they have the added advantage of being created exactly to your specifications. This allows you to express your love of classical composers like Bach and Brahms as easily as you would a band like Nirvana or The Doors. Creating a cross stitch patch is easy, and it shouldn't take you very long. Follow these directions to embellish anything from a pair of jeans to a jacket or bag. Pick your design. You'll want something simple and not too large. You may find a standalone design that you like, or you may wish to choose a piece from a larger cross stitch chart. If you'd like to stitch a patch that features a word or name, simply decide on your favorite alphabet and combine the letters. Start with a piece of felt several inches larger on each side than you wish the finished product to be. The more fabric you have to hold or place in your embroidery loom, the easier it will be to stitch. Cut a piece of waste canvas slightly larger than the area of your design. You should have some extra on each side, but it's not necessary to have as much extra waste canvas as it is to have extra felt. Attach the waste canvas to the felt with small stitches in each corner. Stitch your design on the waste canvas grid, being careful to keep the fabric straight as you stitch. When you've finished your cross stitch design, cut away the sides of the waste canvas and pull out the threads. Your stitches will remain, stitched directly into the felt. Trim the felt close to the edges of the design, leaving a small border. Be careful not to cut so close that you nick a stitch. Sew your patch on a backpack, jean pocket, or any other object you wish to decorate. Enjoy your work! You don't have to limit yourself to patches that express an affinity for a particular musician, of course. You can make patches that bear any kind of words of image that you like. Once you have gained some degree of mastery over making your own patches, your friends will be coming to you with their specific requests. You might even find that you have a lucrative new hobby.